If there was ever a celebrity we were jealous of Anne Hathaway would be just that. She is not only friends with Valentino but the famous designer thinks of Anne Hathaway as his very own daughter. 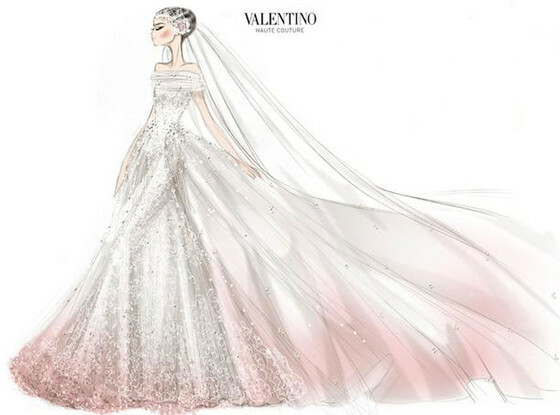 With that in mind, any woman would love to have Valentino designer her a special wedding dress. Anne Hathaway got married late September with fiancee Adam Shulman. Anne Hathaway's wedding dress was amazing. Even the head band looked breathtaking and made the whole gown look like depicted from a romance story of the 1920s. She's sensational. She's fantastic," said Valentino. "She's a girl that...She deserves what she has in this life. [That] means, she's already a great star. But she's going to be a great, great, great, great thousand times great star. She has all the qualities" he added.